We perform coupled climate–carbon cycle model simulations to examine changes in ocean acidity in response to idealized change of atmospheric CO2. Atmospheric CO2 increases at a rate of 1% per year to four times its pre-industrial level of 280 ppm and then decreases at the same rate to the pre-industrial level. Our simulations show that changes in surface ocean chemistry largely follow changes in atmospheric CO2. 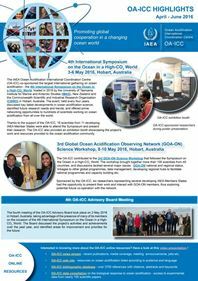 However, changes in deep ocean chemistry in general lag behind the change in atmospheric CO2 because of the long time scale associated with the penetration of excess CO2 into the deep ocean. In our simulations with the effect of climate change, when atmospheric CO2 reaches four times its pre-industrial level, global mean aragonite saturation horizon (ASH) shoals from the pre-industrial value of 1288 to 143 m. When atmospheric CO2 returns from the peak value of 1120 ppm to pre-industrial level, ASH is 630 m, which is approximately the value of ASH when atmospheric CO2 first increases to 719 ppm. At pre-industrial CO2 9% deep-sea cold-water corals are surrounded by seawater that is undersaturated with aragonite. When atmospheric CO2 reaches 1120 ppm, 73% cold-water coral locations are surrounded by seawater with aragonite undersaturation, and when atmospheric CO2 returns to the pre-industrial level, 18% cold-water coral locations are surrounded by seawater with aragonite undersaturation. Our analysis indicates the difficulty for some marine ecosystems to recover to their natural chemical habitats even if atmospheric CO2 content can be lowered in the future. Cao L., Zhang H., Zheng M. & Wang S., 2014. 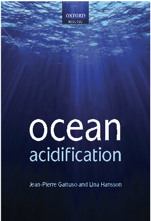 Response of ocean acidification to a gradual increase and decrease of atmospheric CO2. Environmental Research Letters 9(2):024012, doi:10.1088/1748-9326/9/2/024012. Article.